Like most ignorant children, I hated asparagus. I think for most it is an acquired taste. Thankfully I grew up and learned to appreciate this fabulous veggie. Even if it does have a weird side effect. When I saw asparagus go on sale at one of my local grocery stores recently I got excited. I have a recipe on this blog for grilled asparagus, which is one of my favorite ways to prepare it. I also like roasting it in the oven (guess I should post a recipe for that too). 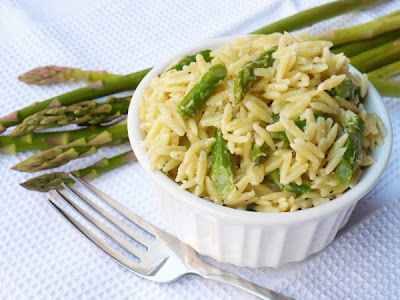 After purchasing a couple of bundles of the stuff, I decided to look up a few other recipes to try while asparagus was in season and cheap. In my search I came upon this little gem. I cannot rave about this recipe enough. It's simple, it's fast, and though the flavors are mellow, they are perfectly in tune with each other. I've made it twice in one week! The recipe comes from Sugar & Spice by Celeste: a food blog that's been featured on the Cooking Channel, Fox News, The Knot, and The Huffington Post. I recommend checking it out! Bring a medium saucepan of water to a boil. Add orzo and cook for 5 minutes. Add asparagus and cook for another 5 minutes. Drain and return to pot. Stir in butter and Parmesan cheese until melted. Add cream until desired consistency. Season with salt and pepper.